Whether you wish to make a one-time gift or set up an automated giving schedule, our online giving system is a secure, convenient option. Think of it as a virtual offering bucket; a way that you can give to FloodGate from wherever you are. Then follow a simple self-guided setup right from your phone. Setup takes about two minutes, tops. 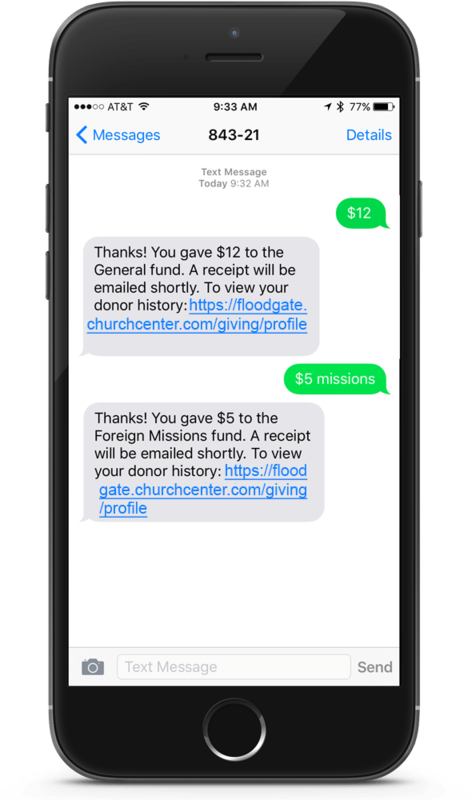 After that, donating is as simple as sending us a text. It’s the easiest & quickest way to donate! Your contribution supports the daily work of the church. Whether you bring your tithe or give an offering, your contribution will be the greatest return on investment—changed lives. Thanks to the generosity of our congregation, the work of the Lord continues to expand; many people enter into a relationship with Christ, and their lives are forever changed. God desires that we excel in the grace of giving because He influences the world through people. God gives to you so He can give through you. Everything you have is a gift from God (1 Chronicles 29:14). As you give, the world is changed for the glory of God: the Gospel is preached, lives are touched, people are fed, bodies are healed, churches are built, and you, in turn, are blessed by God so that you can give again. Online giving allows the convenience and security of electronic, tax-deductible giving for a specific dollar amount to be automatically deducted from a checking or savings account. You can set this up as a one-time or recurring gift. You simplify your life by not having to remember to send in an offering when you are away on a trip or miss the church service. You will be building the church by helping our cash flow to remain consistent from month to month.